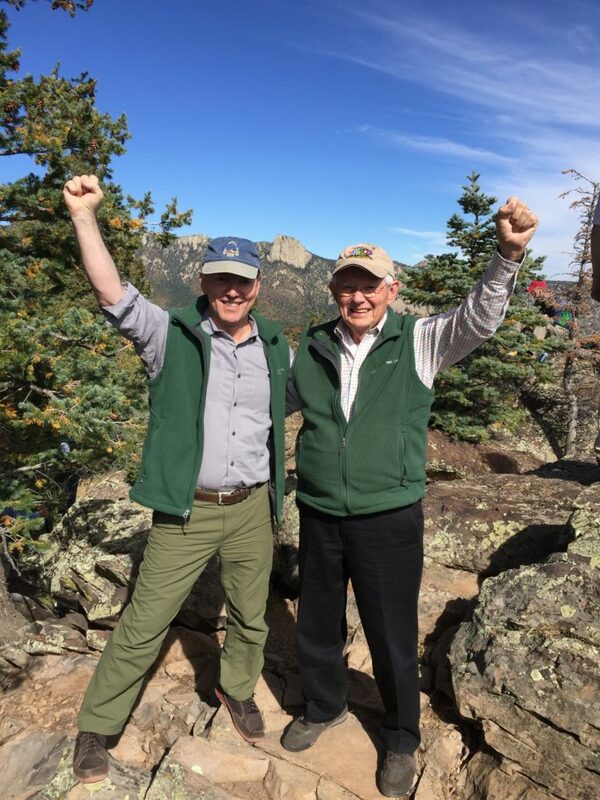 Tom Deimler, 84, is a former Professional Scouter and father of three adult sons: Eagle Scout Mike Deimler, Eagle Scout Tom Deimler Jr., and Life Scout Steve Deimler. 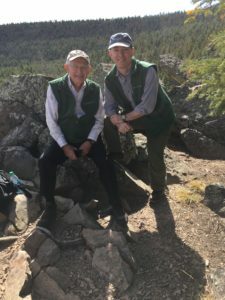 Tom and his son Mike, Senior Partner and Managing Director of Boston Consulting Group and member of the Council’s Board of Directors, recently attended Philmont where together they accomplished a memorable feat. The air was thin, but what else could one expect at an elevation of nearly eight thousand feet. My breathing was rapid and it felt like I could not get enough oxygen into my lungs. Each step was slow and unsteady as we climbed nearly four hundred feet. My eyes fixed only on the narrow trail ahead, I was unaware of the surrounding beauty of Philmont. Here the slippery rocks felt unsure under my boots as I placed one foot ahead of the other. Now the muscles in my legs were burning and the severe pain caused the thought of turning back. It was my good fortune to have the opportunity of participating in the Atlanta Area Council Executive Board trip to this glorious place where so many Scouts have hiked the same trails. My son Mike, a Board Member, had arranged for me to be included as his guest. What a wonderful experience for an eighty-two-year-old father to spend such quality time with his son. Mike, like a true Eagle Scout. was hiking close behind giving me a feeling of safety in the event of a fall. Many of the group forged ahead while a few of us brought up the rear. I stopped to rest and catch my breath frequently, but the thoughts of what Scouting teaches youth gave me new energy. Doing one’s best, not quitting, and achieving goals in life came to mind as I moved slowly up the narrow trail. Like millions of others, the Scouting program has impacted my life in a most positive way. My own forty-year career in Scouting and the character development of my own three sons, two Eagle Scouts and one Life Scout. Turning back was no longer an option and I became determined to make it to the top. Just when the going got the toughest, the strong arm of a Brother Scouter reached out to me. With his firm and sincere invitation to take hold, I felt a surge of adrenaline kick in. Now I had the caring help of a friend to get me up the mountain. Yes, I could make it all the way and surely I did. The view at the top was all that I hoped it would be. One could see for many miles. The mental pictures I took while looking at the panorama below, the magnificent Tooth of Time and the happy faces of my friends who applauded my accomplishment will last forever. Tagged Philmont. Bookmark the permalink.